The marvellous David Rumsey has attacked yet another set of maps for our historical education. California Department of Transportation, Division of Highways, Sacramento. These maps show the development of the freeway and interstate highways in California over a period of 13 years, from 1962 to 1975 when the system grew exponentially. The maps include regional enlargements of San Francisco Bay Area, Sacramento, San Diego, and Los Angeles. 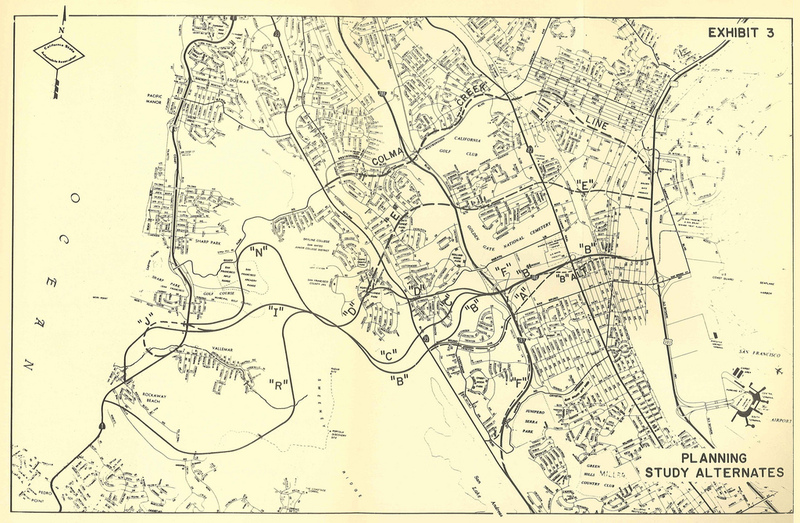 Maps obtained from the Institute of Transportation Studies Library (Harmer E. Davis Transportation Library) at the University of California, Berkeley. These maps show in remarkable detail the growth of highways and interstates we know and love like 280, as well as “ghost” highways that were planned but didn’t make it. They are absolutely enormous — here’s the full 1962 map on davidrumsey.com with pan and zoom controls. As not to bury the lede, using the power of BurritoVision, I made a GIF showing highway construction (and plan evaporation) in and around San Francisco from 1962 to 1974. 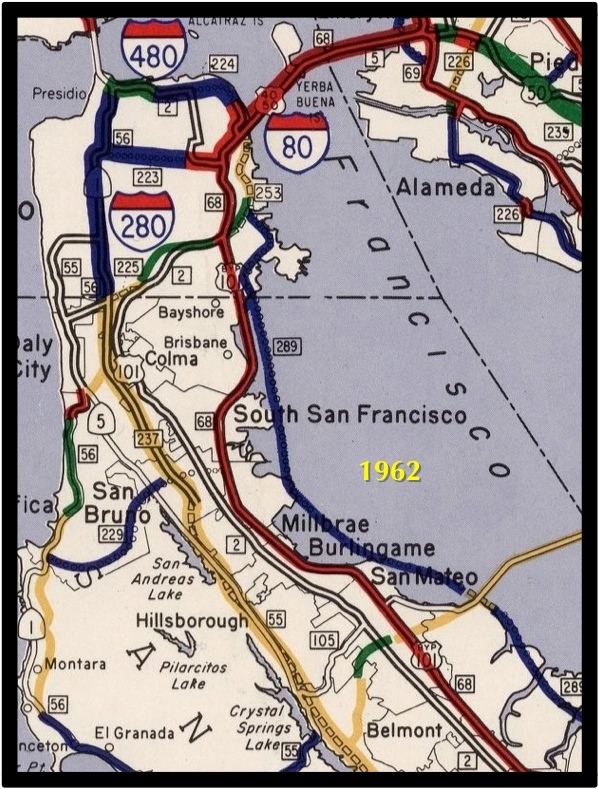 Here’s the inset map for San Francisco and the Peninsula in 1962. There is all sorts of fascinating on this map. 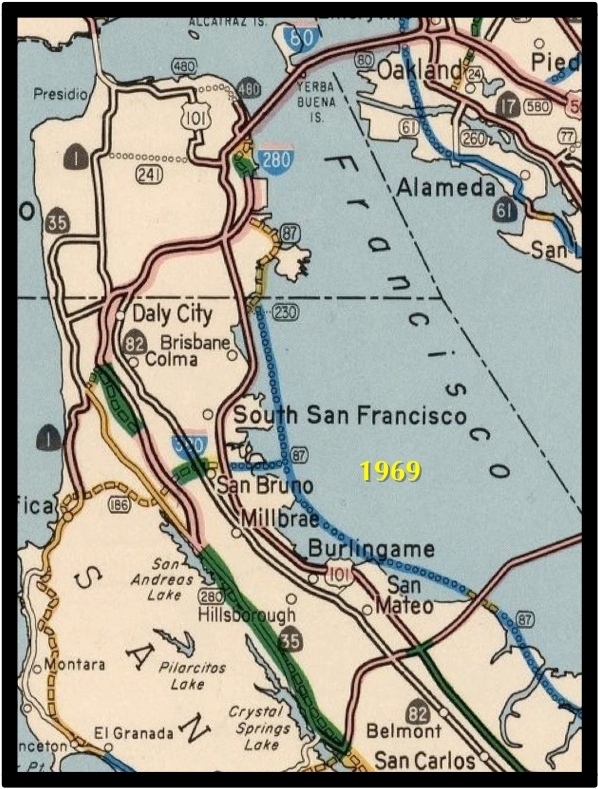 In addition to the highways that were to cut through San Francisco, perhaps the most flabbergasting is “Highway 289” (aka Highway 87) which was to run on/along/in the western coast of the Bay. (A small nub of 87 was built down in San Jose, but stopped at 237). We saw this particularly destructive piece of Bay-eating engineering a few years back when we discussed it in the 1960 San Mateo County Master Plan. And yes, that is a dam along the Dumbarton Bridge. Newer readers may want to review the various proposal to dam the Bay over the years. Anyway, back to these new maps. And 1969 is the last year that Highway 87 shows up. 380 was originally supposed to stretch from 87 (just north of SFO) all the way to Pacifica — so you’re not imagining things when you drive westbound on 380 towards 280 and it looks like they forgot to finish it. This and many other 380 maps over on Eric’s always educational highway and bridge plan Flickr set. 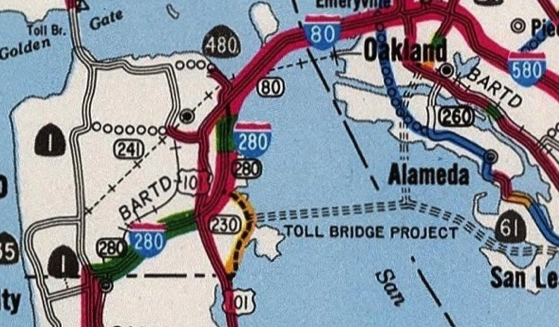 The 1971 map looks more familiar in terms of highways, and BART shows up as well. One notable exception is a Southern Crossing bridge from Hunters Point, with a split to both Alameda as well as to the Oakland Airport. Is the unbuilt 380 extension why there’s an unconnected overpass near the cemetary? Always seemed to me that it would be a cool place to shoot scenes for a post-apocalytic movie. Man, people really hated San Bruno Mountain mid-century — Andrew C. Swanson wanted to level San Bruno Mountain and fill the Bay with it. Go GO 30th St. STATION!! THE TIME IS NOW!!! There is a documentary about all this “Saving the Bay” on PBS/KQED9 right now. It’s fantastic. SF Weekly Roundup: 7 Reasons to Love San Francisco & More!